McMillan complied 105 tackles, one pass defended, two forced fumbles and one fumble recovery in 2018. McMillan posted 10 tackles (seven solo) during Sunday's 17-7 loss to the Jaguars. Analysis: In what has been a disappointing season for the Dolphins overall, McMillan's development can be seen as a rare point of optimism. The second-year pro, who missed his entire rookie season due to a torn ACL, has come on as a leader in Miami's defense down the stretch. McMillan will be a solid IDP play Week 17 against the Bills. McMillan recorded nine tackles (five solo) during Sunday's 34-33 win over the Patriots. Analysis: McMillan equaled a season high in tackles during Sunday's win against New England. The second-year pro has posted at least seven tackles in his last four games, and he will be a solid IDP play against the Vikings in Week 15. McMillan made nine tackles (seven solo) in Thursday's 42-23 loss to the Texans. Analysis: McMillan has posted at least six tackles in each of the last five games, adding a forced fumble in that span as well. The 2017 second-round pick is performing well in his first NFL action -- 47 tackles in eight games -- after missing his entire rookie campaign with a torn ACL. McMillan recorded eight total tackles and a forced fumble in the Dolphins' 32-21 loss to the Lions on Sunday. Analysis: McMillan tied with T.J. McDonald as the team's leader in tackles. After missing his entire rookie season to an ACL tear, the second-year pro has cemented himself as a starter in Miami's 4-3 defense and logged at least six total tackles in his previous four games. As McMillan continues to acclimate to the speed of the NFL, his IDP arrow is trending up. 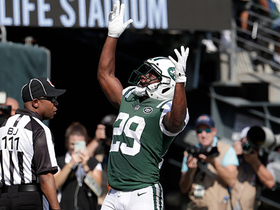 Head coach Adam Gase said Sunday that McMillan will start at middle linebacker to begin the season, Barry Jackson of the Miami Herald reports. Analysis: Despite the fact that McMillan never made his regular season debut with the Dolphins last season after tearing his ACL in August, the team is committed to him being its starting middle linebacker given what they've seen from him before and after his injury. McMillan was a second-round pick in the 2017 NFL Draft after a standout career at Ohio State. McMillan (knee) has been medically cleared to practice and doesn't appear to be operating under any limitations, Omar Kelly of the Miami Sun Sentinel reports. McMillan (knee) is expected to participate in the Dolphins' offseason program next week, Joe Schad of the Palm Beach Post reports. Analysis: McMillan is on the mend from a torn ACL he underwent surgery for last August. It isn't certain how active he'll be in practices next week, but him being on the field in any capacity is a positive development for Miami. The 2017 second-rounder is expected to be the starting middle linebacker in 2018 and his rehabilitation is worth monitoring in nearly all IDP formats. McMillan (knee) is on schedule in his recovery, Joe Schad of the Palm Beach Post reports. 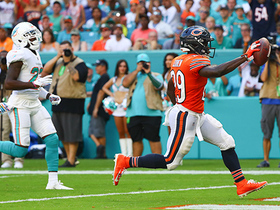 "He's right on, or ahead of schedule," Dolphins general manager Chris Grier said Wednesday. "That's from the coaching staff, the trainers. He's in the meetings all the time. Just talking about how he is and how his approach has been. He should be out there and ready to go in May, out there doing everything and 100 percent." 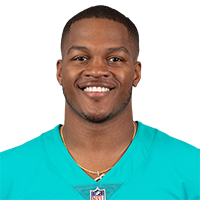 Analysis: McMillan, the Dolphins' 2017 second-round draft pick, lost his entire rookie season to a torn ACL suffered in Miami's preseason opener. The bright side of this situation is that, given the timing of the injury, McMillan shouldn't need to miss any part of the offseason program. 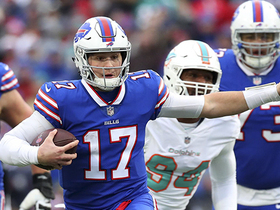 Buffalo Bills quarterback Josh Allen rushes for a 35-yard scramble against the Miami Dolphins. 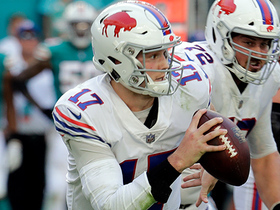 Buffalo Bills quarterback Josh Allen rushes for a 25-yard gain. 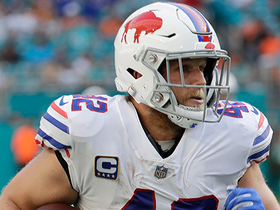 Buffalo Bills quarterback Josh Allen lofts a short pass to fullback Patrick DiMarco who picks up 38 yards. 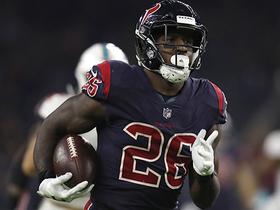 Houston Texans running back Lamar Miller shows a burst of speed for a 58-yard sideline run. 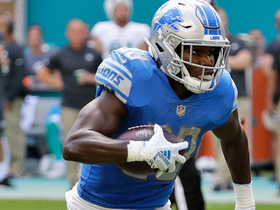 Detroit Lions running back Kerryon Johnson bursts past the defense for a 24-yard gain. Chicago Bears QB Mitchell Trubisky throws back across his body to find running back Tarik Cohen for a 6-yard catch. 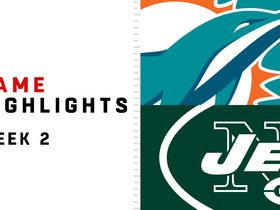 Check out the highlights from Miami Dolphins vs. New York Jets Week 2 of 2018. 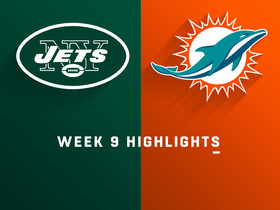 Pass complete to New York Jets wide receiver Robby Anderson as Miami Dolphins linebacker Raekwon McMillan forces the fumble recovering for Miami.